SELF-HELP / FAMILYPart spiritual travelogue, part personal memoir, The Sailfish and the Sacred Mountain is a story of the profound moments that forever change our lives, told in the context of a father and son's journey to the sacred Mount Kailas in Tibet. Every moment in life is a moment of passage. While prescribed rites of passage--baptisms, bar mitzvahs, and confirmations--don't always bring the participant to a higher level of maturity and understanding, there are many other unprescribed moments that stand out as true passages into a new phase of life. These are the moments of triumph or of pain and defeat--the first taste of love, the birth of a child, the death of a loved one--moments after which we know, in the quiet of our hearts and minds, we will never be the same. 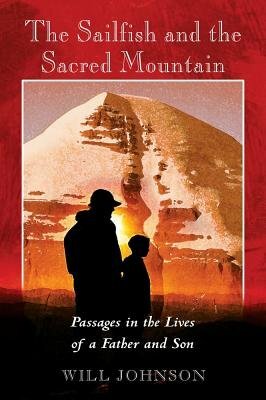 The Sailfish and the Sacred Mountain presents a unique view into how parents can create the circumstances that invite meaningful coming of age experiences into their children's lives. At the same time it encourages adults to welcome events in their own lives that can provide profound spiritual awakening. As Will Johnson reflects on his personal life passages and on the power of prayer and intention in guiding life's direction, he tells the story of the remarkable journey he took with his thirteen-year-old son to Mount Kailas--a journey that proved to be a moment of passage for both father and son. WILL JOHNSON is the founder and director of the Institute for Embodiment Training, which combines Western somatic psychotherapy with Eastern meditation practices. He is the author of The Posture of Meditation; Aligned, Relaxed, Resilient: The Physical Foundations of Mindfulness; and Rumi: Gazing at the Beloved. He livesin British Columbia.